The hazards of this job are legion. The main one has hooves. A bull rider charges into the arena, his heals dug in, one arm outstretched, the other holding on for dear life as he does his best to stay atop his ride. He counts down the seconds until a horn signals time is up, then must take a leap of faith off his bull, entrusting his safety and health to the bullfighters watching his back. 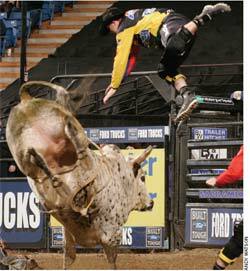 It can easily be said that bull riding, with all of its hazards, is a dangerous sport that requires tough athletes. But bullfighting, on the other hand, requires cowboys to constantly put themselves directly in the path of danger. Bullfighting is downright deadly. Bullfighters wear less protection than a professional football player yet routinely face bulls that are five to six times heavier than any linebacker. Baumgartner describes his PPE as consisting of a kind of football girdle with a chest protector similar to those used in motocross. With the exception of the head, this outfit covers your vital organs and your hips. Many bullfighters also wear a helmet.